A London, Ont. couple wasn't sure if their Friday wedding was a go after Hurricane Harvey stranded them in Houston, but optimism and luck got them home in time for the big day. Londoners Christine Beamish and Max Seferovic have made it back to London, with 36 hours to spare before their Friday wedding. The Western University-educated scientists currently live in Houston, Texas, but are getting married on Friday in London. Those plans were up in the air as the couple was stuck in their Houston home, watching the devastation of Hurricane Harvey destroy their new city — and their chances of getting home in time for the big day. At first, the two hired a driver to get them to the Houston airport, hoping it would reopen. But as more rain fell and flood waters continued to rise, that option was not looking good. So, the two got an airport SUV — with the same driver who took them to the Houston airport — to take them to Dallas, about 400 km away and further inland. "We got a bit of a break. Hurricane Harvey was shifting. We left on an open highway and got to Dallas," Seferovic told CBC's London Morning. It was difficult to sit and wait for roads and the airport to open, unable to do anything, Beamish said. "It's really difficult to watch the news, and we couldn't help anyone," she said. The couple has been "running on adrenaline" for the last four days, and are feeling drained but elated as they settle in for some sleep in London. They arrived in Toronto at about 3 a.m. Thursday morning. That gives them a day and a half to get rested, have a rehearsal dinner, and get dressed up for the 4 p.m. Friday wedding. "A week ago we were having squabbles about who was sitting at what table. It's hard to imagine that those things were so important," Beamish said. "I think now we could show up (to the wedding) in clown costumes and people would be happy." 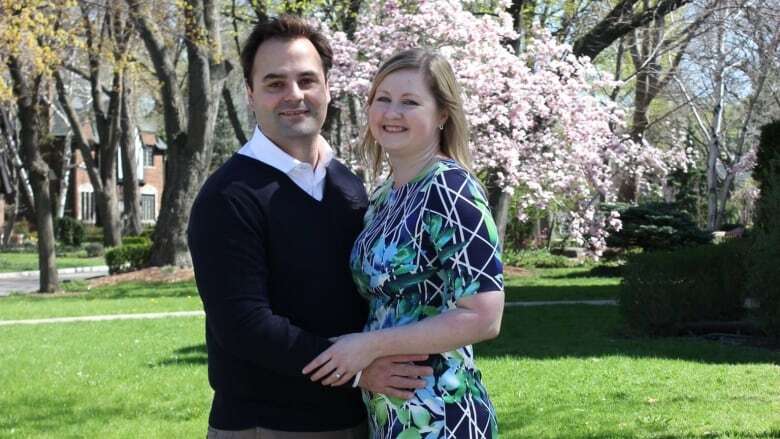 The couple said the outpouring of love from family, friends, and strangers who have heard their pre-wedding tale have left them "thrilled and humbled."